Since then, I've been the recipient of two more "off hours" deliveries. Both of those were at 7:30 in the morning during the week. I had just finished my shower and heard footfalls on the front steps. Mija charged down the hallway out of the living room, stopping by the open bathroom door (If you have cats, the bathroom door is never closed.) to look at me and then at the living room where came the sound of the storm door opening and closing. Once I got dressed, I checked and here were packages being delivered. 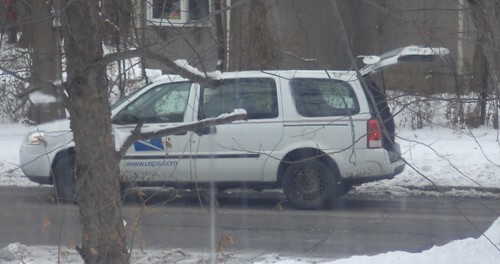 In spite of their deficit, the post office certainly lived up to their delivery motto. The package from Patt had this sticker affixed to it. If you've shipped anything, this is what you get asked every time you ship. I save time by, when I ship, telling the employee, "There's nothing fragile, liquid, perishable or potentially hazardous", unless there is, in which I say, "It's fragile. I'd like it stickered as such." They know me at the post office so they kind of chuckle when I answer the question before they have a chance to ask it. But, I've never seen them put this sticker on my packages unless it was in the back where I wouldn't see. Another item from the post office which I want to tout is their tracking capability. On Priority Mail packages, it's included in the price. On Parcel Post and First Class, it's an extra 90 cents. It is worth that 90 cents unless you don't really care about the contents of your package. I have a story from this year's shipping to illustrate the value of this 90 cents. Before Thanksgiving, I shipped two packages to Carole in Virginia. She was on vacation at Disney World at the time, but I wanted her to have them when she returned. The packages contained her birthday and Christmas gifts. There was no difference in cost between First Class and Priority (it's based on weight), so I shipped them Priority Mail. The tracking bar code was applied and the number was printed on my receipt. They were to be in Virginia on the 21st. Fast forward to November 27th. Carole calls me to ask when I shipped the packages because she doesn't have them. My heart sank. Filing claims with the post office is an exercise in how much paperwork can you endure. Plus, they require photos of the items in the missing boxes and how do I claim hand made scarves? The value of those would lie in the cost of the yarn, I guess, not the time it took to make the scarf. (Yes, I have had to do this once. It wasn't fun. The box turned up within a week of filing the claim.) If I could find the receipt with the tracking number, Carole said we could see when or if the boxes had been delivered. I had recently cleaned off the desk and tossed a whole bunch of paper into the recycling bin. Thankfully, I had not emptied the house bin into the bin outside. I found the receipt. If you search for USPS tracking, up comes a page where you input the 10 number on your receipt. The page shows you the status of that package from the time it was entered into the system through its delivery at its destination. We discovered the packages had been delivered November 22nd. I gave her the tracking number and she called the local post office. The postmaster there verified what we were seeing, that the parcels had been delivered. Unfortunately, that delivery person was off on the 27th so Carole would have to stop by or call on the 29th. At that point, they would ask her where she put the boxes. On the 29th, Carole went to her car, sitting in the driveway to run errands. There, on the front passenger seat, were the boxes. She'd left the car unlocked through her vacation and someone put the boxes there. We don't think it was the delivery woman. We think it was the person who received the boxes in error, although it wasn't either of the neighbors because they said they hadn't seen boxes for her. I had printed the address correctly on them, always a concern, so we are confused, but Carole got her gifts, even if the birthday gifts were a day late. My point is that tracking is worth the extra money I spent on all my parcels this Christmas. I actually had fun typing in the long strings of numbers and seeing where parcels were en route. It's fascinating to see where a box goes when you ship it from Glen Ellyn, Illinois to San Antonio, Texas, all the stops, all the sorting. And that's something else I want to remind you of when you vilify the carrier to whom you gave your knick knacks for shipment this Christmas. To get from me to Carole involved 7 separate stops; Glen Ellyn to Addison to Chicago to Washington D.C. to Alexandria, VA to Warrenton to her. That the post office told me, on Tuesday, November 19th that they could get two boxes from Glen Ellyn to Warrenton by that Thursday is no small feat. If you draw a line from Dallas, Texas to Bangor, Maine, all along that line, in December, there was crappy weather. I think we should cut the shipping companies a bit of slack for being able to do what they do in spite of the bad weather. At least the post office was upfront about letting people know of delays, particularly if they were shipping to a storm affected area of the country. The post office can get a, sometimes deservedly, bad rap for a lot of things. My experiences during this monster shipping season were uniformly positive. If you have something to ship, I strongly endorse utilixing the tracking ability. If there is a claim, it's a good indication of where the packages were on any given day. The Sunday and early morning deliveries will probably cease now. That's okay, too. Hearing footsteps on the front steps as you're stepping out of the shower is a wee bit disconcerting.